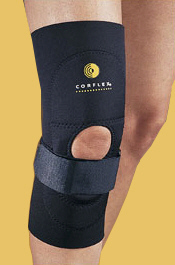 Features patella pad with circumferential strap to provide compression over affected area. Indicated for treatment of Osgood Schlatter disease and Jumper’s Knee. Manufactured from premium grade latex-free neoprene. 1. Slide sleeve onto affected leg so kneecap is centered in opening. 2. U-shaped buttress should be placed below kneecap. 3. Wrap 2" elastic strap around knee and attach to itself to desired comfort level. Close all contact closures and hand wash in warm water with mild soap. Product should be air-dried, do not use high temperatures to wash or dry. At Mid Patella Measurement 6"